Going to the Character Screen and repeatedly clicking the Level Up button will take to to the Level Up screen for the character. After the level up options are selected and you click "done" the screen will become black. 3) Proceed to level up. 5) Game will black screen with background music still on. Not being able to level up without the required experience. While in the black screen you can click and hear clicking noises should you click around the lower left part of the screen. You cant enter any menus while in the balck screen and the only option is to corcibly close Pillars of Eternity. There is no crash message or anything. I had just finished the Dragon Egg Quest and had recieven some XP for that. 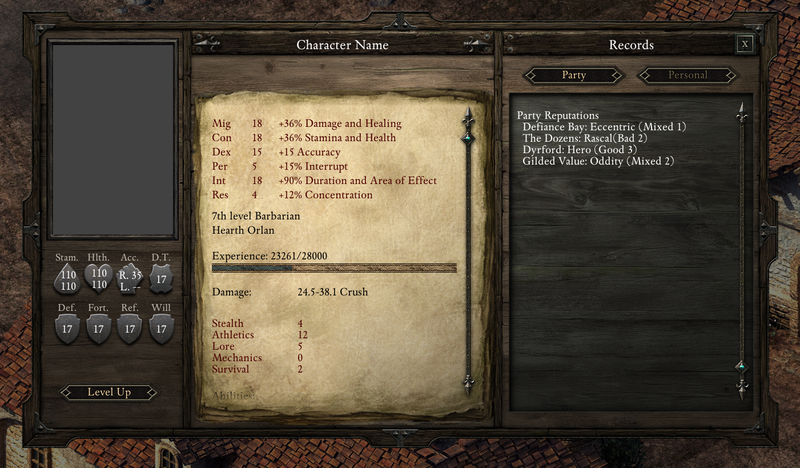 I also had a 6th party member in the form of a level 5 Chanter. Whenever I open that save and open the Character Screen I get a mess of text and numbers and have to click on the "next character" button to get rid of them though the character portraits and names never appear despite their information appearing. re-loading does not solve the black screen isssue mentioned above as there is no way to re-load afaik. Edited by Fiebras, 07 September 2014 - 03:39 PM.